There are probably very few travellers who sing the praises of airlines, aircraft, airports and the travel industry in general more than the “eccentric globetrotter,” Brother Michael Bartlett, a sometime contributor to BTN. He is a regular visitor to Tunisia (48 visits in 30 years). When possible, he chooses to fly with Alitalia from London City Airport to Rome enjoying the connecting flight to Tunis, returning either via Rome and/or Milan again with the Italian airline or through Paris Charles de Gaulle with Air France. This is a unique two-part ON TOUR. With this Part 1 Michael reflects on the ‘pleasures of air travel’. Part 2, in a future issue, will tell readers all about the Republic of Tunisia. Michael writes: “For the outward journey connecting times are comfortable and can be anything between 45 minutes and 2 hours. The transfer at Rome for the outward flights is simple, one being driven by bus from the Embraer 190 to Terminal 3, going straight upstairs to the “Zone E” Area from where the Tunis flight will usually depart. Easy and pleasant. It is rare for me to have luggage in the hold but on this occasion expecting to be away for up to three weeks I had succumbed to temptation and taken a few extra clothes, books and luxury items such as a small kettle and handed them over in trust to the airline at the “baggage drop” desk at LCY. How wonderful to walk through security and the x-ray machine with nothing to declare other than the clothes one was standing up in, a passport, boarding card, wallet and notebook and pen in the pocket. I had begun to consider this a thing to do in the future. My idea changed on arrival at Tunis Airport when after a long wait I discovered that my bag had got “delayed” somewhere! (See AND FINALLY) I was not alone and following an hour’s wait I was provided with a PIR Report (Property Irregularity Report) ref TUNAZ 16885 and told to enquire, “tomorrow.” I provided the name of the hotel at Sousse at which I would be staying some 100 miles south of Tunis expecting that when the bag arrived arrangements would be made for it to be delivered to the hotel. Ha Ha! This experienced globetrotter had a lot to learn. Frequent telephone calls to Tunis Air Ground Handling, being the agents for Alitalia got nowhere until a text message eight days later, sent from a London telephone number, informed me that the bag awaited collection at Carthage Airport. I travelled back north by train (the state of that train was disappointing) to Tunis and then by taxi to the airport to collect the bag. The PIN was not sufficient evidence as to who I was and I needed both the passport and boarding cards as well as having to go through security. The hurtful thing was to learn that the bag had been at Tunis Airport for a whole week. 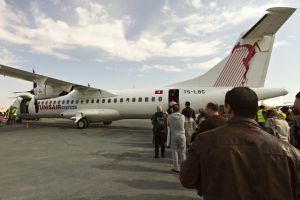 It had been delayed at Rome’s Fiumicino Airport for 24 hours but had arrived at Tunis a day late. I do not know who was to blame but it had taken the agents and the airline seven whole days to inform me. I challenged the Alitalia staff at their airport office and was simply informed.. “We do not deliver delayed luggage in Tunisia. The passenger has to collect”. I have put in a claim for expenses. How many weeks will that take? For the return journey it was irritating and a little uncomfortable. The fully laden Airbus 319 from Tunis landed at Rome and became parked far away from the terminal. Passengers were crammed in like cattle are put in a truck on its way to market. We were taken to an entrance of Terminal 3 where for some reason or other one had to go through security again. I was somewhat baffled. On the outward journey coming from London transit passengers had been able to walk straight into “Zone E.” On this occasion all had to wait in a long queue, show their boarding card and then go through security. The half-drunk bottle of water purchased airside at Tunis airport was taken from me. On the outward journey the bottle of water I had purchased airside at LCY was allowed through! I am only a traveller and am undoubtedly ignorant with regard to much of the industry, economic, political and social way of life of the Tunisian people. Salt, olives, phosphates and crude oil bring in revenue. Plus tourism. I was in the country a few days after the start of the “Spring Revolution” in January 2011. I witnessed the immediate withdrawal of foreign visitors. Regular visits since then have shown to me a gradual closing of hotels, restaurants, as well as businesses in the town, kasbar and medina areas. There does appear to have been a growth in buildings, residential and commercial, although many are unoccupied. Tunisian’s are friendly. You are always made welcome by the immigration staff at airports. They know about jobs. The only industry to which one has to be careful when doing business is that of the “taxi” at airports and railway stations! Some drivers are hesitant to use the meter and come out with 101 reasons why there is a set charge for wherever the visitor has asked to be taken! Anything up to 300 or 400% of the normal fare. But this is true around the world is it not? I will not condemn Tunisia alone on this count. Visit Tunisia. It is a welcoming country.